In our Turquoise Learning Center you will find handy history, facts, and tips for buying Turquoise and Turquoise Jewelry with an emphasis on Turquoise History. Feed your passion for making jewelry, collecting gems, or your obsession for Turquoise! Check back weekly as we are always adding new and useful articles to this section of DurangoSilver.com. We love Turquoise and we are proud to share our knowledge with you in our Turquoise Learning Center. Turquoise Lore, Spiritual Beliefs & More! We hope you enjoyed the Durango Silver Company Turquoise Learning Center. We hope you will come back often and use our Turquoise Learning centers as references and educational resources for your journey through the world of jewelry, gems, and of coarse Turquoise! 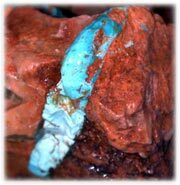 Our Turquoise Learning Center is full of information and guides on Turquoise, Turquoise Mining, and Turquoise Jewelry. You will be able to find interesting facts as well as useful information; from the basics of Turquoise to how to care for your Turquoise. Whether you would like to learn how Turquoise is formed or would like to know the history of a specific Turquoise mine, watch videos on how to cut a cabochon, or read about grading Turquoise, you can rest assured that all your questions are answered here. If you do not find what you are looking for in our Turquoise Learning Center please contact us and if we feel we can write an article on the subject that is factually correct we will add it to this information resource. We hope you have learned a lot and will be able to make highly educated purchases in the future. Please also visit our Jewelry Learning Center for specific information regarding the sky stone. Thank You for visiting our Turquoise learning center.